In 1606 Pedro Fernandes de Queirós sighted Butaritari and Makin, which he named the Buen Viaje (‘good trip’ in Spanish) Islands. 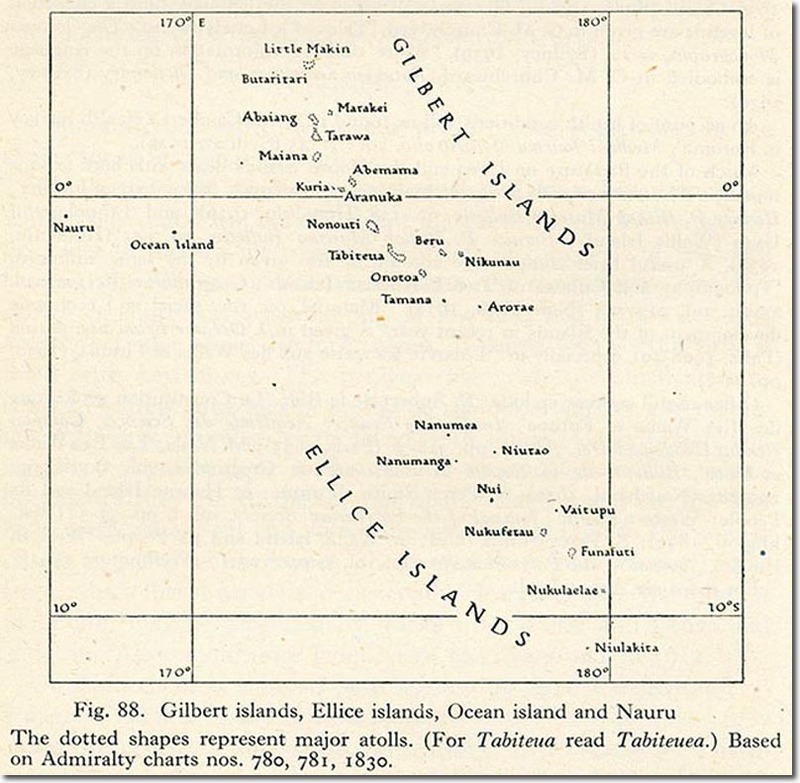 The Gilbert Islands were named in 1820 by a Russian admiral, Johann von Krusenstern after a British captain, Thomas Gilbert, who encountered the archipelago in 1788 whilst exploring an Outer Passage route from Port Jackson to Canton. 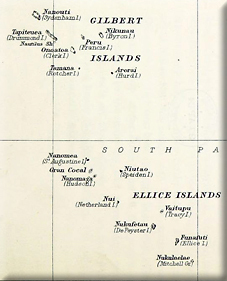 Funafuti atoll was named Ellice's Island after Edward Ellice, a British politician and merchant, by Captain Arent de Peyster,who sighted the islands in 1819 sailing on the ship Rebecca. Ellice owned the cargo of the ship! The name Ellice was later applied to all nine islands after the work of English hydrographer Alexander George Findlay. 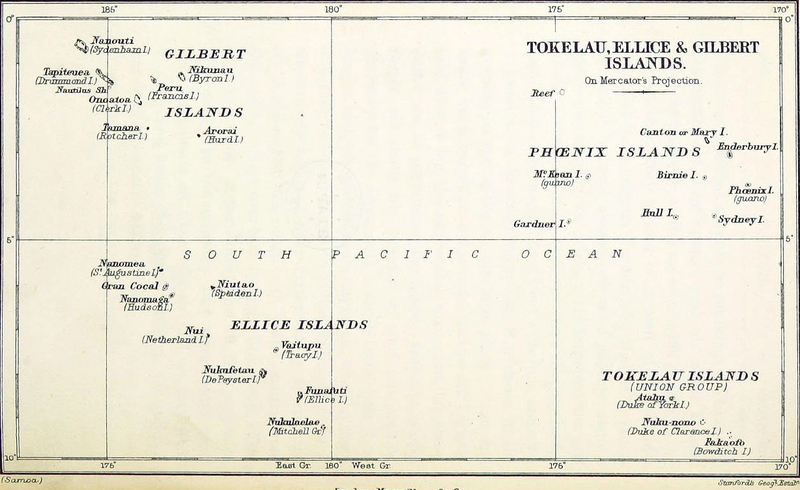 The location of the islands came under British protection by the issuance of the 1857 Pacific Islanders Protection Act which had been designed to help protect islanders from rapacious and unscrupulous commercial exploitation. The islands weren't named specifically, but the location was covered by the ordinance of the Act. The area covered was called the British Western Pacific Territories Protectorate from 1877 onwards. The Islands were formally brought under British protection in 1892. Captain Davis of HMS Royalist claimed them between 27 May and 17 June of that year whilst Captain Gibson of HMS Curacoa did the same for the Ellice Islands between 9 and 16 October of that same year. The British Western Pacific Territories (BWPT) were administered by a High Commissioner resident in Fiji. A Resident Commissioner, Charles Swayne, was appointed in 1893. The protectorate's headquarters was established on Tarawa Atoll in 1896, where Resident Commissioner W. Telfer Campbell presided from 1896 until 1908. The conduct of W. Telfer Campbell was criticised over his legislative, judicial and administrative management (including allegations of forced labour). The headquarters were moved to Ocean Island in 1901. This move in headquarters arose from the operations of the Pacific Phosphate Company resulting in increased shipping traffic to Ocean Island with its increased economic activity. Increased German interest in the Pacific region and the outbreak of World War One speeded up the conversion of the Protectorate to a Crown Colony. The process was completed in 1916. 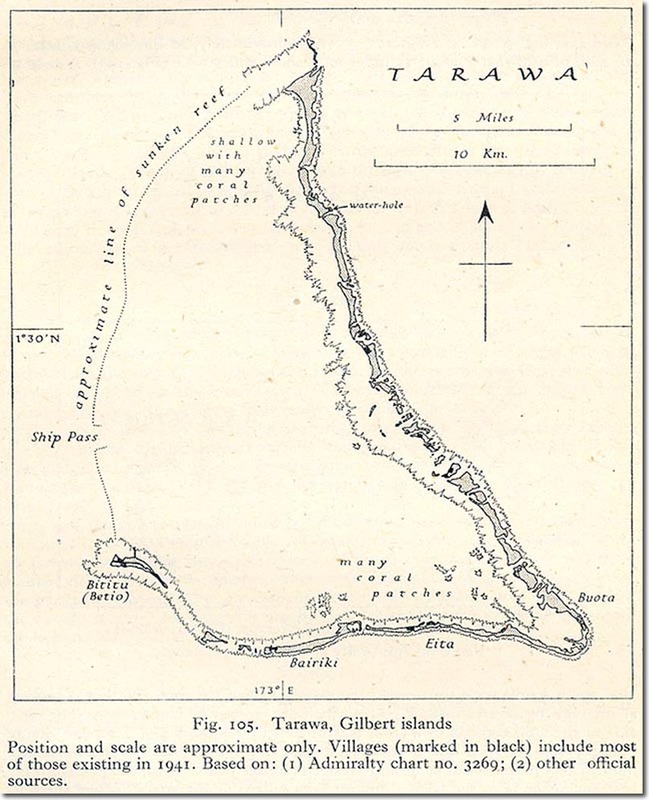 The Gilbert and Ellice Islands Colony continued to be administered by a Resident Commissioner. 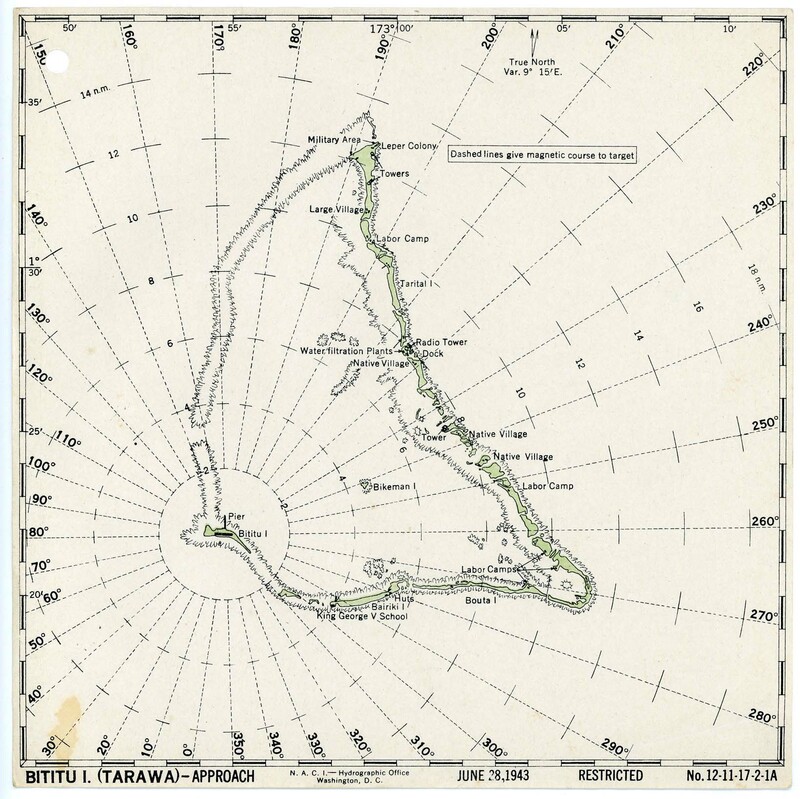 In 1930 the Resident Commissioner, Arthur Grimble, issued revised laws, Regulations for the good Order and Cleanliness of the Gilbert and Ellice Islands, which replaced laws created during the BWTP The Phoenix Islands were added to the colony in 1937. Ocean Island remained the headquarters of the Colony until the British evacuation in 1942 during the Pacific War as the Japanese occupied the islands. 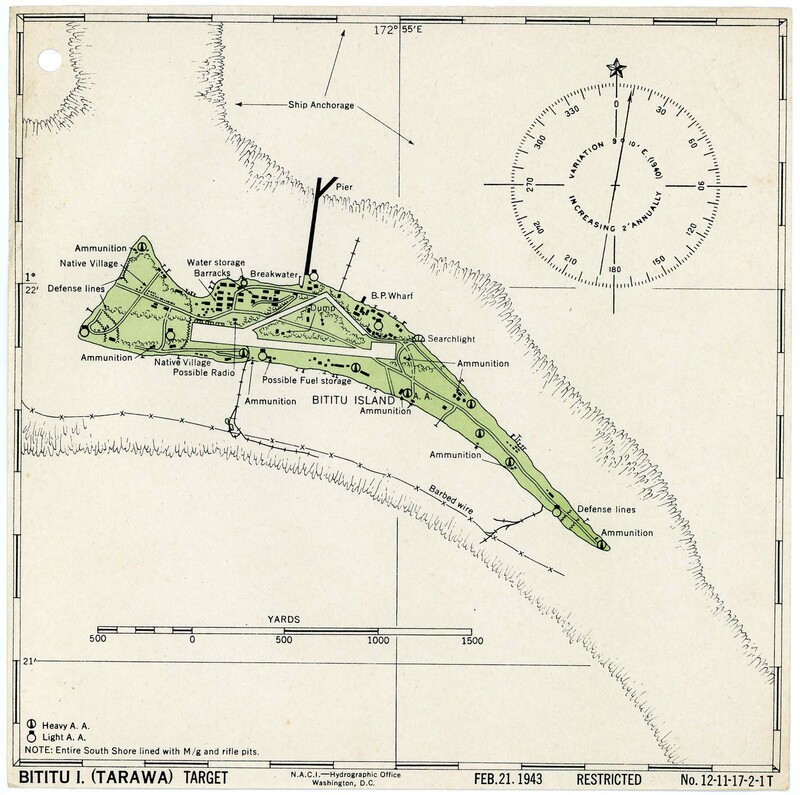 United States forces landed in Funafuti on 2 October 1942 and on Nanumea and Nukufetau in August 1943 and constructed an airfield and military bases on each island. The atolls of Tuvalu acted as a staging post during the preparation for the Battle of Tarawa and the Battle of Makin that commenced on 20 November 1943. After World War II, the Colony headquarters returned to Tarawa from its temporary Funafuti location. By the Tokelau Act of 1948, sovereignty over Tokelau was transferred to New Zealand. A select committee of the House of Representatives was established to consider whether the Constitution should be changed to give legislative power to the House of Representatives. In 1974 Ministerial government was introduced in the Gilbert and Ellice Islands Colony through a change to the Constitution. It was becoming clear however that Tuvaluans were concerned about their minority status within the Gilbert and Ellice Islands Colony. In 1974, ethnic differences within the colony caused the Polynesians of the Ellice Islands to vote for separation from the Micronesians of the Gilbert Islands The following year, the Ellice Islands became the separate British colony of Tuvalu. The Gilbert Islands attained independence on 12 July 1979 under the name Kiribati. The name Kiribati (pronounced kʲiriˈbas) is a local linguistic derivative of the term 'Gilberts'. R E N Smith explains the housing situation for colonial officers like himself serving in the Pacific in the post-war period. R. E. N. Smith recalls his time as a District Commissioner in the Gilbert Islands and in particular his reliance on the marine transport available to keep the islands of the dispersed archipelago in touch with one another. R. E. N. Smith recalls his 'interaction' with the local wildilife in the Gilbert and Ellice Islands with a particularly pushy Reef Heron. John Pitchford discovered that the people of the Gilbert and Ellice Islands had an innovative use for condoms! John Pitchford describes the onerous duties of collecting money in the far flung Gilbert and Ellice Islands - although the job did have its compensations. Don't Step on a Stonefish!